What a week for the markets and oil! The S&P 500 added almost 70 pts or 3.5% and closed just shy of 2,000. The S&P 500 is now down just 2.2% since the start of 2016. Oil climbed higher throughout the week as well ending the week above $36 with a 5% gain on Friday alone. While it's great to see the markets rebounding and my various portfolios climbing along with it, the thing that really gets me going is seeing dividends hit my accounts and getting raised. This past week two of the companies I own gave me a pay raise which is awesome. That's now 11 increases among my holdings thus far this year which is absolutely wonderful. Especially when you add in that I had to take a pay cut from my day job last year, but the majority of the companies I own continue to grow their dividends. I've been reading a lot of Pat Dorsey's book on successful stock investing and I highly recommend it so far. Even though it's not about dividend growth investing there's a lot of great information in there in regards to both quantitative and qualitative evaluation of companies. I'm also reading, well browsing, The Devil's Financial Dictionary by Jason Zweig (affiliate link) which is a brutally honest look at the financial/investment industry. The book gives the true definition of financial terms often in humorous ways. Each week during my Weekly Roundup I plan to highlight one of the terms. "Dip, n. and v. A decline in an asset's market price that has been brief and shallow, so far - as were the first few days of the Crash of 1929 and of the 2008-2009 global financial crisis. Although not all dips turn into disasters, nearly all disasters begin with a dip. Investors who believe that "buying the dips" is a recipe for success should be careful what they wish for; there may be more dips to buy than you have the willpower to withstand." I've been home this entire week and didn't get as much writing done as I'd like because I've been catching up on a bunch of other things. I have been doing a bunch of reading this past week though and have been getting a lot of other ideas to write about and share with all of you. I finally got my measurements as well as an updated weight and I'm pretty happy with the results. Since I started the challenge on January 18th, approximately 1.5 months, the tally is 15 pounds lost and 15.3 inches lost. I've still got a long ways to go but I've made solid progress so far. Last weekend my wife and I ran in the ConocoPhillips Rodeo Run and did the 10k. It's was pretty tough considering all I had done was walk about 3 miles at the most and did no training for the run. So finishing in less than 1.5 hours is pretty good in my book. Especially since I felt a lot better than I expected to. Last month I wrote about how we're shifting our focus to building up cash reserves and then paying down some debt. I hate to be on the sidelines in regards to the markets but it's a necessary step to shore up our finances. One thing that I've been wanting to do is sell off some of my ESPP shares for a couple reasons. 1) To diversify away from my employer especially since the oil field isn't strong right now and 2) to raise cash to help build our cash reserves and assist in debt pay down. The problem with selling my ESPP shares is that the tax situation is much more complicated than normal purchases on the open market. You get taxed on the discount you receive, 15% in my case, so if I sell for less than a 15% gain I'm paying taxes on income I didn't truly realize. However, the rise in oil over the last couple weeks has boosted my ESPP share price as well and some shares crossed back over the 15% gain level so I sold some of the shares. Overall it was a pretty solid return considering it was just over a 2 month holding period and 5 months from the first time the cash was withheld from my paychecks. I haven't received the dividend on these shares yet but the ex-div date has already passed so it's owed to me. 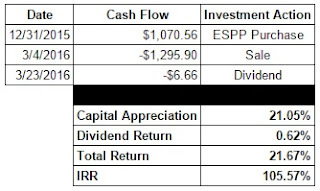 A 21% price appreciation and 0.6% dividend return is good for a 21.7% total return. Accounting for the time I actually owned the shares that's a 105% internal rate of return. If only I could find a way to get that with all of my holdings! In case you missed them, here's the posts from Passive-Income-Pursuit this past week. Thanks for the mention, JC. Glad to hear that things are going well...and those dividend raises always help, dont they?! Thanks for the mention PIP. 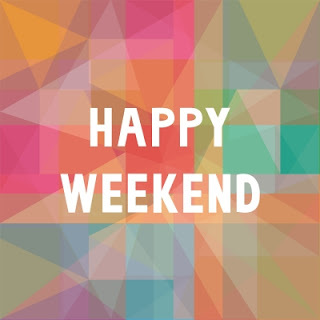 Hope you Have great week ahead!